The issue becomes even more acute when you consider how important Dr Walker’s Listener columns were. At first fiery and then more scholarly, they introduced The Listener’s mass readership to ideas it may not have had to consider before. I’d unhesitatingly nominate Morgan as a writer who could fill that role now. It just seems a no-brainer. But as you say, the lack is particularly acute in the case of Maori voices in the mainstream. There is a distinct Maori worldview and we are all the poorer that it is so inaccessible. Surely Toi Iti on Media Take is in 'Joycean' terms 'pretty regular'? Destiny Church apologist Potiki's sidelining seems to have happened in parallel with hereditary Rogernome James Caygill's elevation from Ngai Tahu property manager to virtual Tangata Whenua. Note that Lizzie Marvelly said yesterday she has Te Arawa heritage and today writes in her Herald column about Waitangi Day in that context. 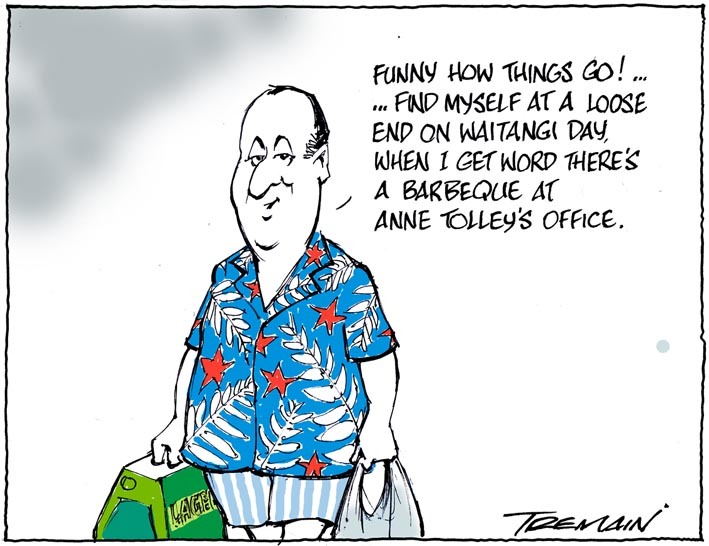 I also see that Lizzie Marvelly’s column, like most other MSM coverage of Waitangi Day, does not note that for the first time since the passing of the ‘Mondayisation bill’ in 2013, that we get a holiday on Monday for Waitangi Day falling on a weekend. Is it because it was a bill introduced by Labour? or what? Ha ha – it is! It's not actually a Hendrix doco, but part three of Music Moguls, on music PR, and it's an amazing if alarming, watch. I actually know a few Maori, writers of all kinds of things. Not one of them, I believe, would stoop so low as to work in the MSM. One of the highlights of my media career was getting the Sunday Star Times to give Selwyn Muru a column. He produced almost of year of columns, amusing, sometimes angry, always illuminating. Then the section editor changed and he was dropped for an Iain Sharp column, which as far as I am aware never generated a single watt of illumination, apart from the glare of his whiteness (which he can;t help of course). Maori columnists are few because they do not fit in the narrow band of acceptability that has ruled NZ print media forever. For instance why on earth has Keri Hulme has never had a newspaper column? Her work in Te Karaka, the Ngai Tahu magazine, is wonderful. Then the section editor changed and he was dropped for an Iain Sharp column, which as far as I am aware never generated a single watt of illumination, apart from the glare of his whiteness (which he can;t help of course). I gather he's a very nice man, but I very much get what you're saying. Selwyn was a firecracker. Selwyn took a bit of a shine to me in the 90s when I had to interview him for a story once. He had a lot to say, than man. He's still with us, of course, but suffering from dementia. Dr Walker and his wife were also very pleasant to me when I met them two or three times in the 90s. I'd formed this picture of him as being very severe, but he wasn't like that at all. One revelation for me last year was realising how much “the Maori media” had replaced mainstream news outlets and websites for me, Maori Television news and current affairs shows in particular. I include Media Take in that, and other outlets such as Te Karaka. Maybe now we do indeed have the pakeha media, overwhelmingly for and by pakeha and reflecting the culture (or lack thereof), and in parallel the Maori media, for and by Maori. For instance why on earth has Keri Hulme has never had a newspaper column? She did for a while. in her post Bone People flush of media friendliness. It was in one of the then Sunday papers, when she also wrote occasional Listener reviews. I'd be real surprised if the powers-that-be at The Press these days realise she's a product of North Beach. When I sought Don Selwyn's endorsement of Te Rerenga Wairua, an animated film based on the spirits' journey in the afterlife, he reacted like an Old Testament prophet with dire warnings of supernatural consequences. Naturally I was chastened, until a helpful intermediary suggested a meeting with the late Don Selwyn. Always unshakeably amiable, Don told me not to worry about Selwyn Muru, as he probably didn't want anyone else touching the story before he got around to doing his own version. As he had so many projects on the go there was no risk of that happening in the foreseeable. Of course every time something went wrong, which it often did, I'd think "Ah this'll be Selwyn Muru's makutu", but so far, touch wood, I'm still cool. I was most impressed by his front fence, an amazing hybrid of pa palisade and junk sculpture. He told a story about a German tourist knocking on his front door asking for a copy of "the plan", so he could replicate it back in Germany. The trouble this time is the Trans-Pacific Partnership Agreement, or TPPA. People oppose it for the same reason people used to have mullets – fashion, not logic. Being of Ngāpuhi descent myself, it’s been a real struggle to understand why local Maori are protesting a trade agreement. When I sought Don Selwyn's endorsement of Te Rerenga Wairua, an animated film based on the spirits' journey in the afterlife, he reacted like an Old Testament prophet with dire warnings of supernatural consequences. Sorry, that should read "When I sought Selwyn Muru's endorsement". At the time I most definitely never confused him with Don Selwyn. Hey thanks for the love Joe, keeping it classy I see. If I were to speculate I'd suggest Tahu's stopped writing due to his health. For your records Joe, I'm not a Rogernome, I prefer to be identified with things I've actually done so if you want to attack me blame me for the fifth labour government, not the fourth. I've never worked for Ngai Tahu Property, or any of the iwi's commercial subsidiaries. I was for three years the General Manager of Tribal Interests for the Office of Te Rūnanga. One of the teams in my group managed the tribal properties returned to the iwi as part of the settlement. I'm not remotely sure what "elevation ... to virtual Tangata Whenua" means, but to be clear, I'm Pakeha, my partner is Ngāi Tahu and Ngāti Porou. That's a hair-splittingly fine distinction.